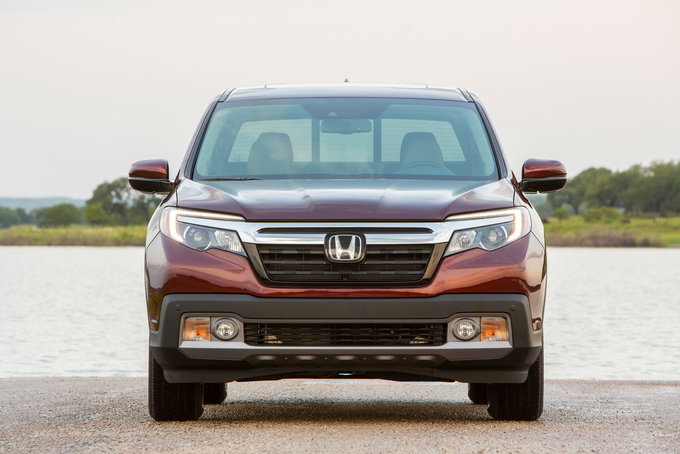 We have information you must know before you buy the Ridgeline. The carryover 2019 Honda Ridgeline in stock and ready, but don't expect any aggressive offers on it. We don't expect the lack of attractive deals to change anytime soon. 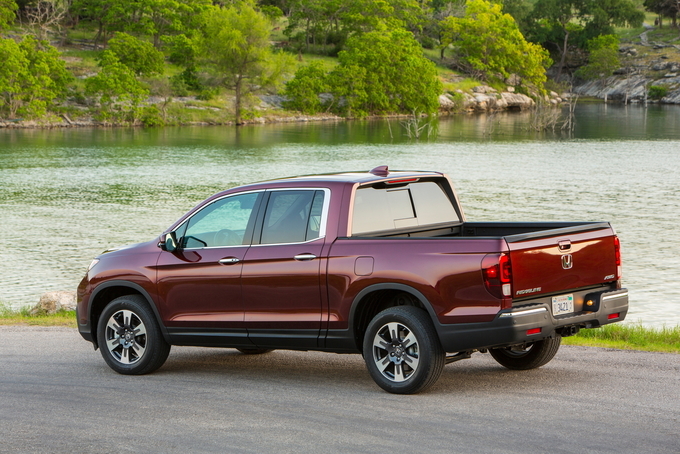 Though Memorial Day is drawing near, we expect Honda to remain firm on not offering any special deals on the 2019 Ridgeline. Honda resets its offers after April 30, 2019, but we expect the Ridgeline to continue its deal-free ways. Honda uses unadvertised incentives to help dealers provide better prices. That hasn't been the case with the Ridgeline, though, and we don't expect this to change soon due to its supply and demand. There are no low-interest financing deals on the 2019 Honda Ridgeline, and we honestly can’t say we expect any. Your dealer may help you get attractive financing locally if you ask. Dealers sometimes have relationships with banks that enable them to leverage better rates than a consumer could get on their own. Unfortunately, there are no advertised lease deals on the 2019 Honda Ridgeline. If supply and demand shifts, we could see a change here, but don't hold your breath for it. You can still lease the 2019 Ridgeline from your local dealership, but don't expect large discounts like most other Honda models. The Honda Ridgeline may not be every truck owner’s cup of tea, but it does bring Honda’s sense of practicality, versatility, and reliability to the world of pickups – and that’s not a bad thing. The Honda Ridgeline returns largely unchanged for 2019, with only a couple tweaks to standard features on the lower trims. Buyers get a wide variety of choice in the features of their Ridgeline, but only one choice of engine. That’s a 3.5-liter V6 producing 280 horsepower and 262 pound-feet of torque, paired with a six-speed automatic transmission. Those figures are mid-pack among midsize pickups. Front-wheel drive is standard on all except the top two trims, with all-wheel drive usually available as a $1,900 option. One of the Ridgeline’s distinguishing features is its unibody construction, which means that the body and the frame are constructed as one piece. In the case of the Ridgeline, that piece is essentially the front half of a Honda Pilot with a truck bed for the back. 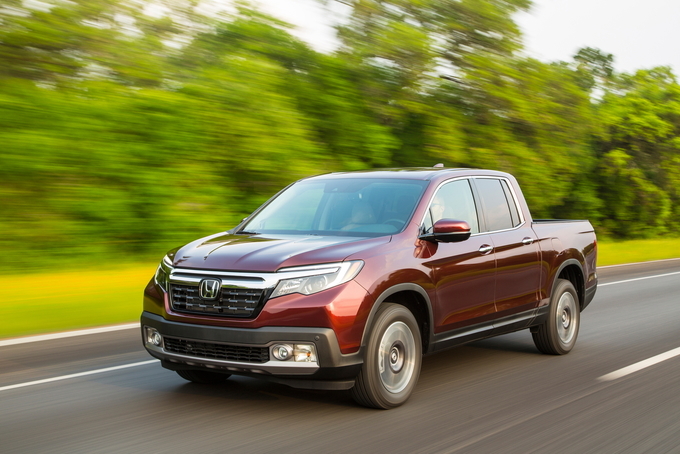 The upside is less mass, which gives the Ridgeline better-than-average mileage for its class – the EPA estimates 19 miles per gallon city, 26 highway, and 22 combined for FWD models, with AWD at 18/25/21. The downside is that the Ridgeline isn’t as customizable as some other trucks on the market. There’s only one bed length and one cab option. This won’t be a problem for many buyers, but those that prefer a six- or eight-foot bed will have to look elsewhere. 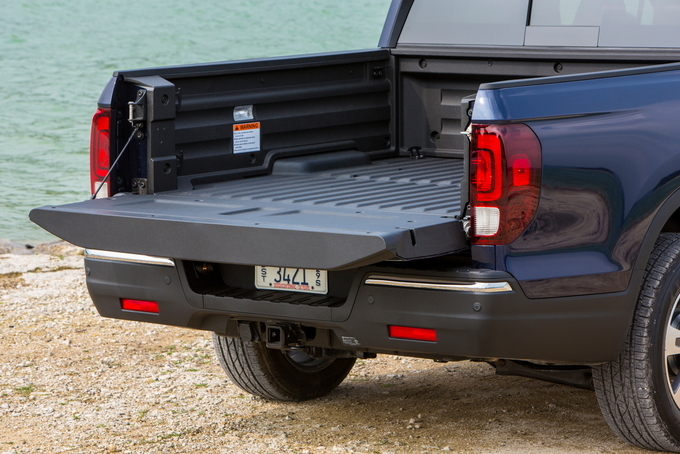 On the upside, the Ridgeline is versatile in other ways – its tailgate can open traditionally or swing outward like a door, while every model features an in-bed trunk that features a drain. Yes, it does work as a built-in cooler for tailgating. The other benefit of the borrowed unibody is a well-appointed and spacious cabin. 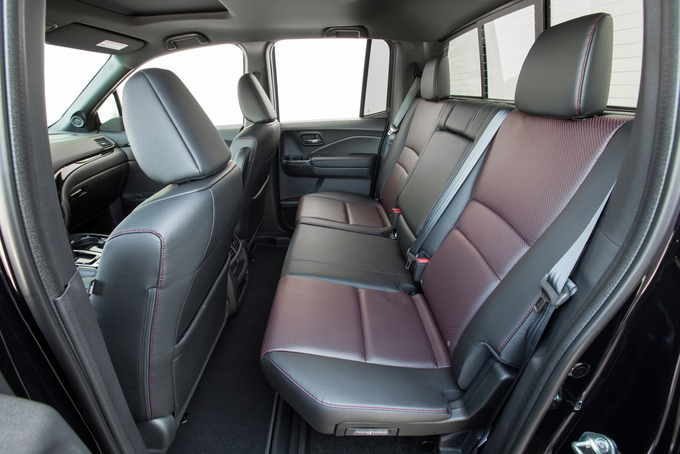 Passenger areas are roomy, with rear seating for three and a handy under-seat storage area. All models come with premium features like push-button start, LED interior lighting, and a rearview camera. Otherwise, features are divided among six trims: RT, Sport, RTL, RTL-T, RTL-E, and Black. Aside from all-wheel drive and dealer-installed accessories, Honda doesn't do optional extras. Unless otherwise noted, there are no option packages available for the Ridgeline's various trims. After a $975 destination fee, the Ridgeline RT starts at $30,965, making it the cheapest in the lineup. Honda touts the Ridgeline’s livability, even in base form: the RT boasts USB connectivity, full Bluetooth functionality, and a 60/40 rear bench. There’s a trunk in the truck bed for extra storage, and a Class III trailer hitch is standard. This trim comes only in front-wheel drive – all-wheel drive is not available. The RT comes with a 4.2-inch LCD infotainment screen, but functionality is basic. 18-inch alloy wheels are standard, with fancier designs available as options. Only two exterior colors are available on the RT: silver and a dark gray. For $34,365, the Ridgeline Sport adds in a few useful luxury features. Automatic tri-zone climate control is standard, as are fog lights and remote start. The Sport still rolls on 18-inch rims, but it unlocks a couple more color choices for the exterior (black and white). All-wheel drive is a $1,900 option on the Sport. In addition to the features on the Sport, for $35,845 the Ridgeline RTL gets you leather trim, a power moonroof, and heated power front seats. 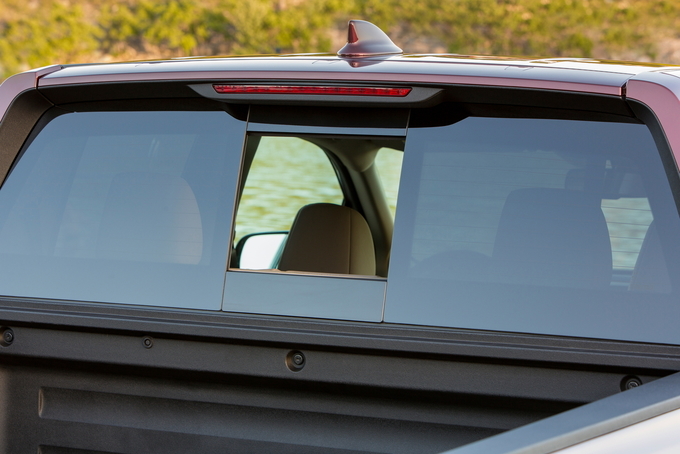 The rear windows are powered, and an acoustic windshield helps decrease cabin noise. A full spectrum of colors is available on the RTL, and Honda adds in heated side mirrors on AWD models. Starting at $37,975, the RTL-T adds in some of Honda’s safety and technology features. At this trim, the Ridgeline comes with an eight-inch infotainment touchscreen equipped with Android Auto, Apple Carplay, and Honda’s satellite navigation system, and an auto-dimming rearview mirror. Honda's LaneWatch is also standard. Flip the right turn signal on, and a camera positioned under the passenger-side mirror beams a view of the driver's blind spot to the infotainment screen. It's not as quick to respond as a traditional blind-spot monitoring system, but it does the job well enough. The RTL-E includes Honda’s full suite of safety tech. For $42,895, the RTL-E adds in automatic emergency braking, adaptive cruise control, lane assist, blind-spot sensors, and cross-traffic monitoring. Front and rear parking sensors are standard, as are automatic low- and high- beam LED headlights. 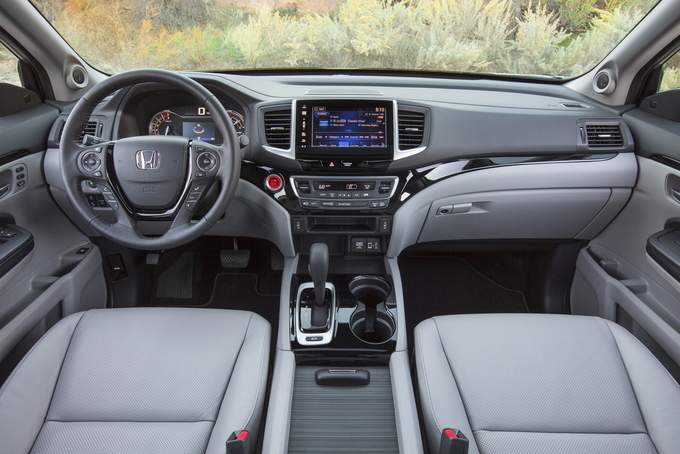 Honda also adds a couple luxury features like a heated, leather-wrapped steering wheel and driver’s seat memory settings. All the tech features from the RTL-T are included here, and all-wheel drive is standard as well. The Ridgeline Black Edition is an aesthetic addition to the line. For $44,395, the Black Edition includes black trim, a black leather interior, black wheels, and red ambient LED lighting. Otherwise, the trim is unchanged from the top-of-the-line RTL-E. Looking past its limited off-road abilities, fussy infotainment software, expensive active safety features, and pricey bottom line, the 2019 Honda Ridgeline offers class-leading handling, a comfortable and high-quality cabin, and an ingenious, functional bed. Ridgeline prices begin at $30,965 for the front-wheel-drive RT and top out at $44,395 for the all-wheel-drive Black Edition. Sitting between these trims are the Sport, RTL, RTL-T, and RTL-E, all offered with either front- or all-wheel drive. Choosing an engine and transmission is simpler – a 280-horsepower, 3.5-liter V6 paired with a six-speed automatic transmission is all that's offered. The base RT trim comes with the usual power features plus keyless push-button start, a five-inch touchscreen, Bluetooth, LED taillights, 18-inch alloy wheels, an integrated class III trailer hitch, and a rearview camera. You have to opt for either the RTL-E or Black Edition model to get forward collision warning, automatic emergency braking, adaptive cruise control, lane keeping assist, lane departure warning, road departure mitigation, blind-spot monitoring, and rear cross-traffic alert. Honda's Lane Watch passenger-side camera is standard on the RTL-T trim only. At the top of its class in performance and handling, the Ridgeline's V6 engine offers crisp acceleration and pairs nicely with the smooth-shifting six-speed automatic, while the crossover-based chassis carves corners more like a car. Irregular road surfaces are handled with aplomb (even better than the Pilot) with much of the credit due to a center bed reinforcement, as well as hydraulic suspension bushings, dual-action dampers, and, on AWD models, a rear torque-vectoring system. Payload capacity – which tops out at 1,569 pounds – is right in line with Chevy's body-on-frame Colorado. The Ridgeline's unibody construction and lack of low-range gearing also make it a less-than-suitable off-roader. The litany of transgressions also includes an acceptable 7.9 inches of ground clearance that's reduced to six inches below the rear control arms, and a shortfall in torque compared to the Canyon/Colorado, resulting in a 5,000-pound towing capacity that's 2,000 short of GM's twins. The Rideline also lacks hill descent control, while its approach and departure angles can't match those of its competitor's off-road editions. 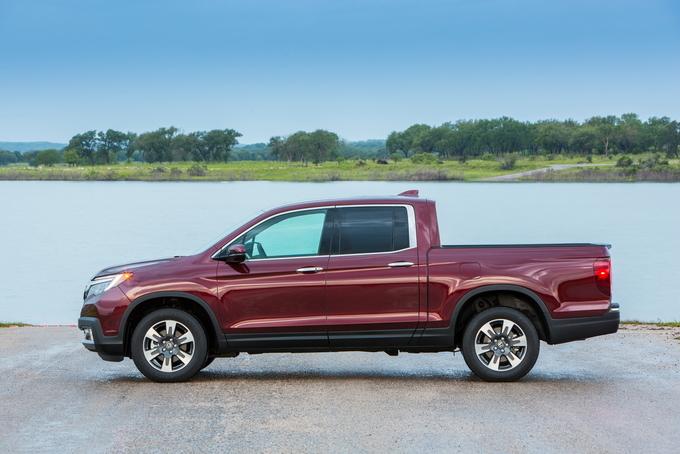 Looking more like a truck than the first-gen model, the latest Ridgeline sports near-vertical bed sides and rear glass, a traditional pickup bed, and a version of Honda's current corporate SUV grille. It holds a well-finished interior that takes its design cues from the latest Pilot, and storage solutions – such as back row magic seats that flip up to hold a bicycle – that can be traced back to the Fit. The front seats have a nice adjustment range, while back seat comfort is far superior to both the Colorado and the Toyota Tacoma. Topping things off, the UV-stabilized plastic bed doesn't need a bedliner. The tailgate both swings out and drops down, while a built-in lockable trunk under the bed floor – perfect to hold wet clothes after a camping trip – is big enough to hold an 82-quart cooler. All is not perfect, as the front seats are a bit flat, the infotainment software is slow and counterintuitive, and you have to step up to the RTL-T to get the larger eight-inch touchscreen that comes with Apple CarPlay and Android Auto capability. Contractors will pass because the 63-inch bed length falls short even with the optional bed extender, despite the 50-inch width being sufficient to accommodate the width of plywood and sheetrock. Versatile with a capital "V," the Ridgeline works because it's a two-row Honda Pilot with second row magic seats and a lot more cargo capacity. We only wish its advanced safety features were available across the lineup. The Ridgeline's spacious, high-quality interior and versatile, functional bed should attract families and empty nesters. At the same time, weekend warriors will find that a number of its competitors offer better off-road capability. 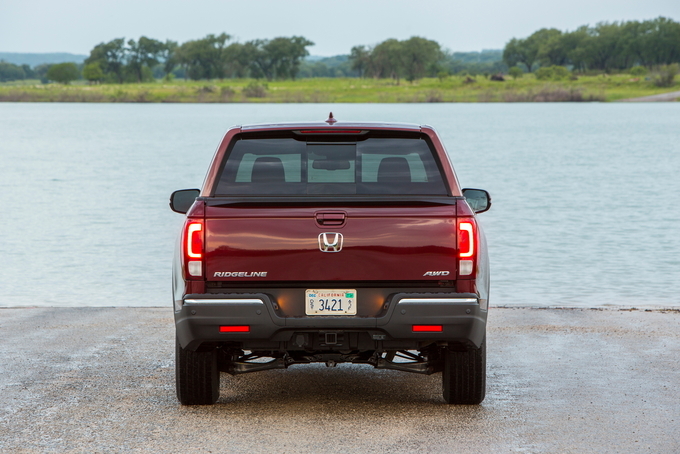 Despite high sticker prices, the limited availability of active safety features, and off-road utility that's eclipsed by many competitors, the 2019 Honda Ridgeline's segment-leading handling, comfortable interior, and highly-functional bed make it a top pick in its class. We have partnered with trusted dealers in your area to give you a great price on the new Honda Ridgeline.